Works great and very comfortable!!!! This holster is exactly as expected out of the package. Much better than other leather holsters I have previously bought. Definitely a roughneck in many aspects. Great holster along with great service from JM4. Had mine for approx 3 weeks now. I have about 6 or 7 other iwb holsters. This is by far the most comfortable one I own. Very simple design. Easy on easy off. Good retention. Ride height can be anything you want it to be. Very satisfied. Would highly recommend this holster. Ordered the Large roughneck for my M&P 2.0 compact 3.6 inch (similar to the m&p9c). 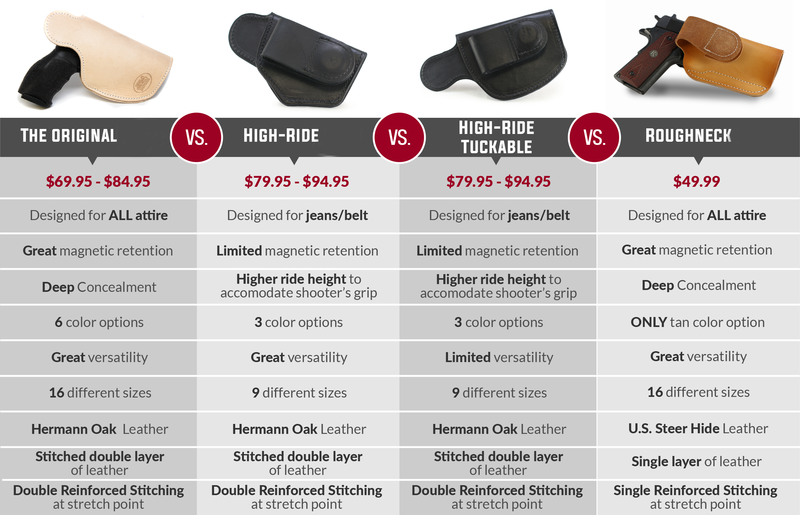 Most hybrid or leather holsters are too bulky. Kydex is fine, if flat enough, but typically hard to keep positioned when canted. This holsters is thin, flat faced, and sticks where you clip it! Only other holster that even comes close for me is a 2 clip phalanx stealth operator, and it does not cover the muzzle! Tried my Cz p10c, PCR, Glock 19, and ppq in it just for kicks. Will probably order a large long in the high ride to accommodate my longer slide edcs. Thank you! Very pleased with this holster. The retention is good. It is comfortable to carry.